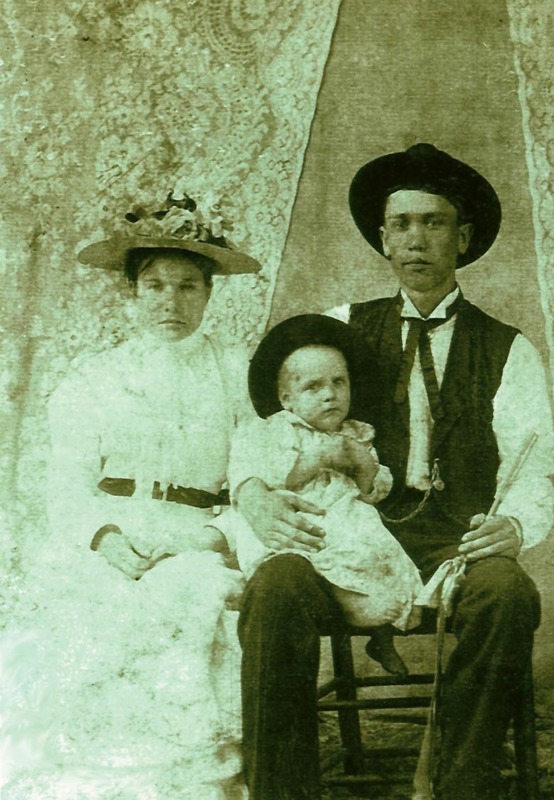 Picture of Sallie, John and son Willie Breshers about 1897. 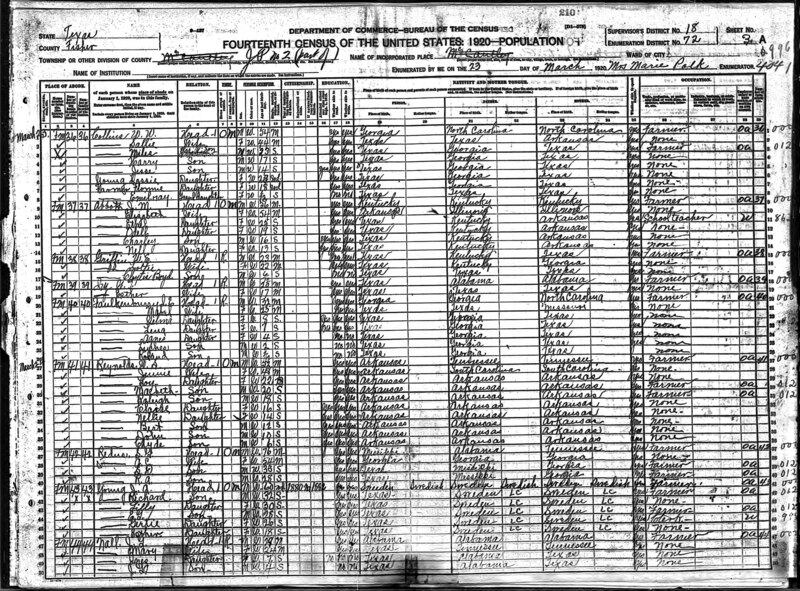 Why is Sallie Breshers listed as Aunt on Mary Lee Arrick's birth certificate? #1 She's an Aunt! - a sister of John Riley Arrick or Manerva Viola Harrison - No other records confirm this. Manerva is thought to be part Choctaw, as is Sallie. #2 She is not related but agreed to sign as such so Mary Lee could obtain SS benefits. or a sister of James R. Alphin, Manerva's last husband. #4 She's Aunt to the other signer - Fannie E. Alewine. #5 Fannie is the Aunt and the certificate has an error. #6 Is she connected somehow through her sister Jane Prator? Mary Lee Arrick is daughter of John Riley Arrick and Manerva Harrison. 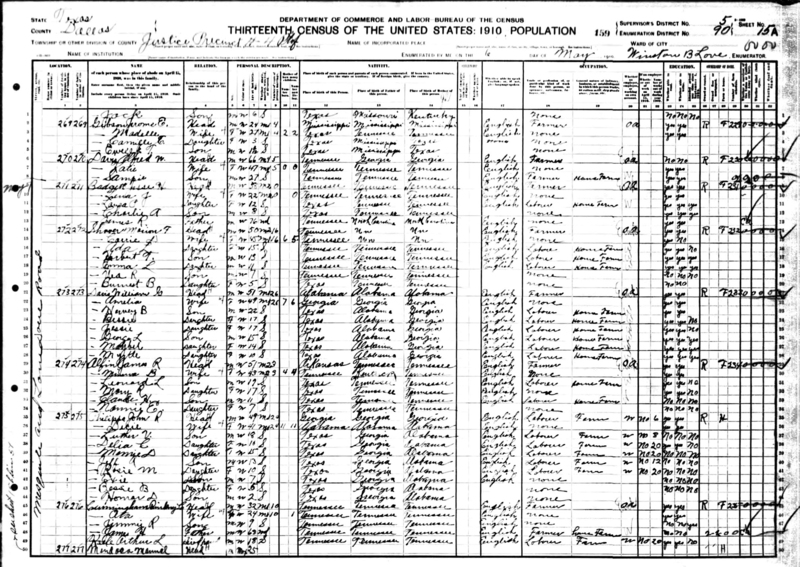 Here she is in the 1900 Kaufman census with John and Manerva. 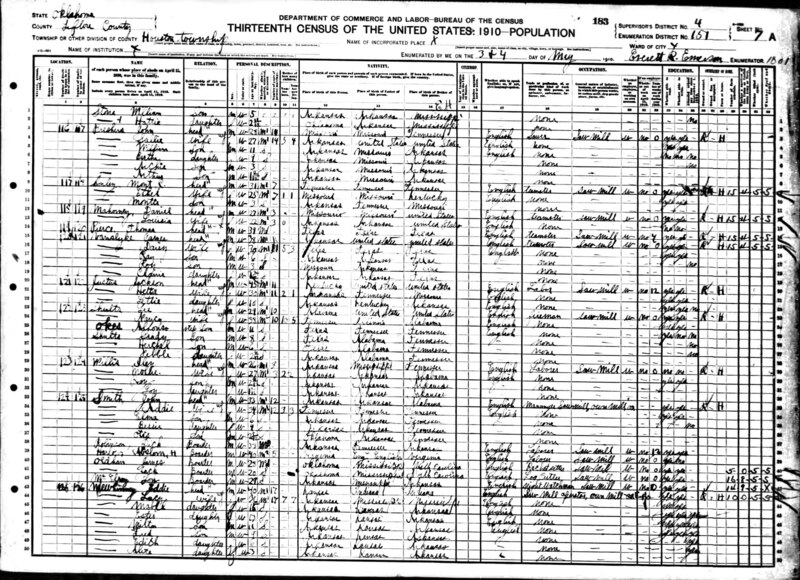 Here she is in the 1910 Dallas census with Manerva's new husband James Roy Alphin (incorrectly entered as Alfin). 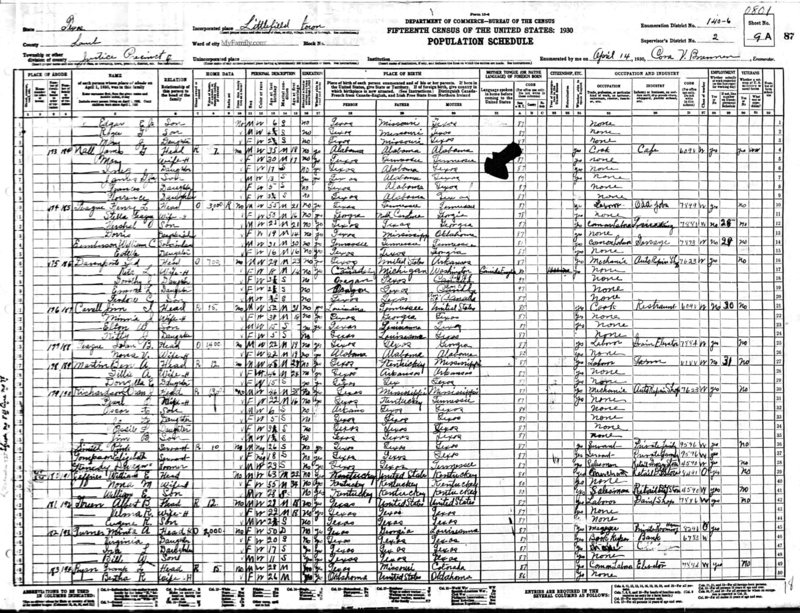 Here she is with her husband James Granville Nall in the 1920 census in Fisher TX. 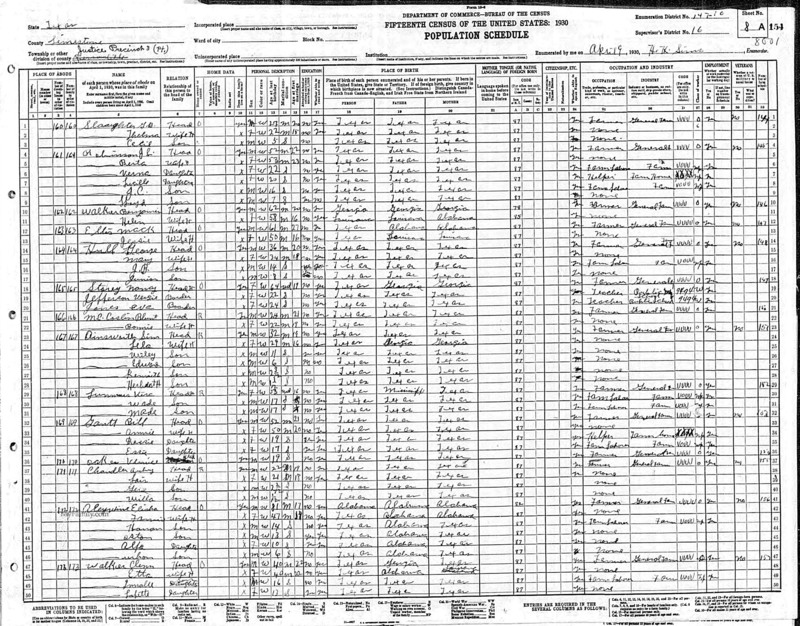 Here is she is in the 1930 census in Lamb Littlefield TX. 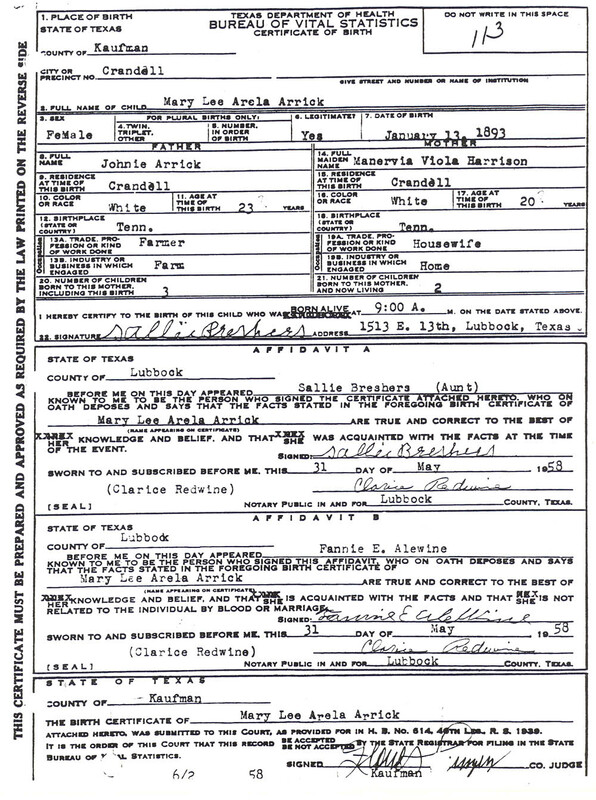 On May 31, 1958, Mary Lee requested Social Security benefits but didn't have a birth certificate. 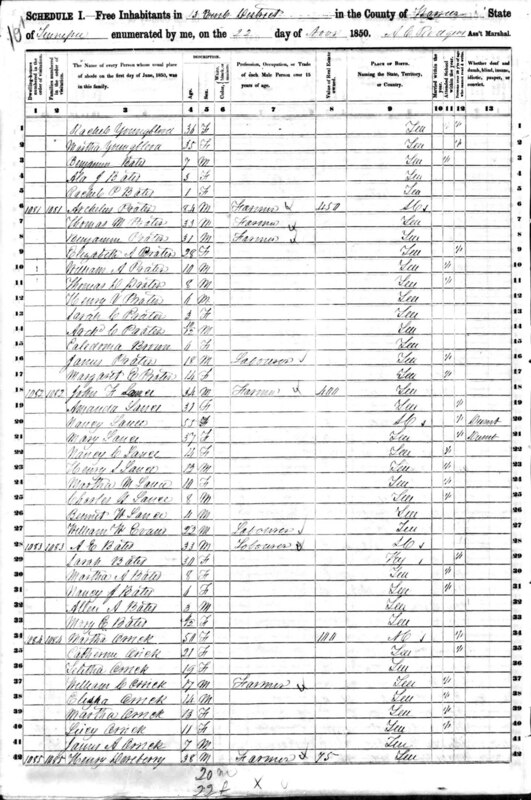 #2 Fannie E. Alewine - Listed as not related by blood or marriage. Clarice Redwine in Lubbock TX was the Notary Public. Mary Lee died 4 Sep 1959 and is buried in Lubbock, TX. Lived at 1515 E 13th St Lubbock in 1958, Lived at 2106 An? M? 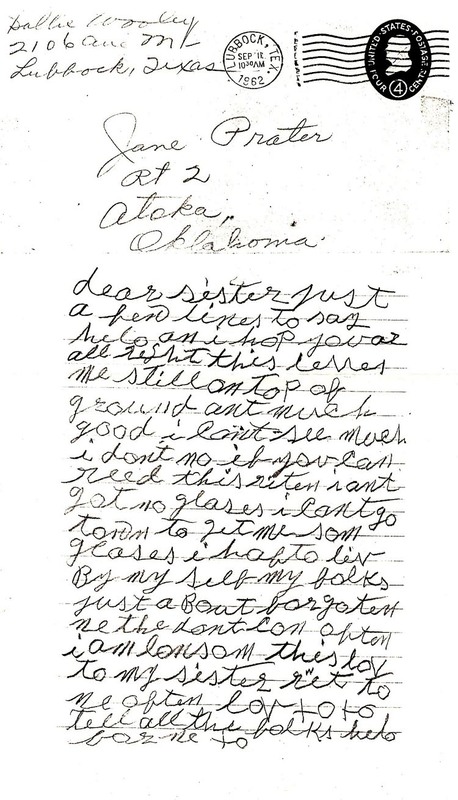 Lubbock in 1962 (see letters). 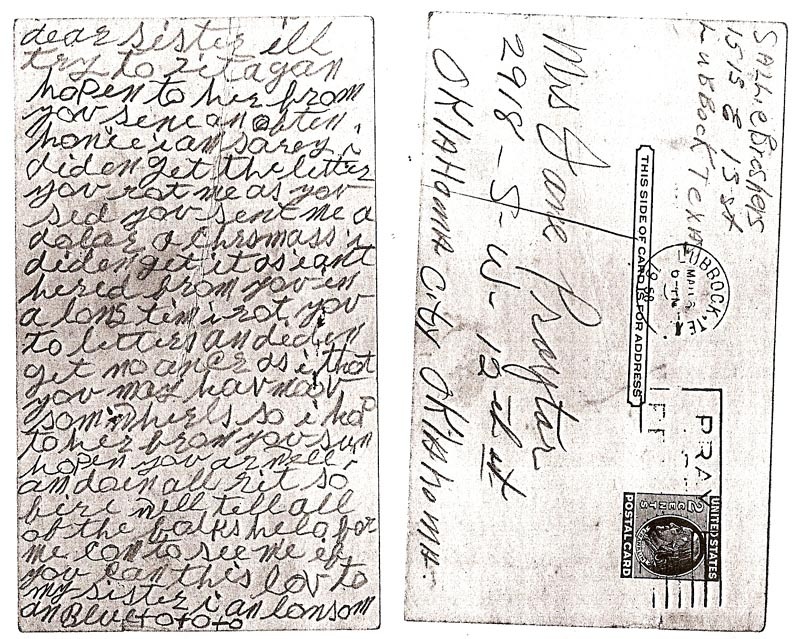 Sister Jane Praytor or Prater in Oklahoma City OK in 1958, Atoka OK in 1962 (see letters). 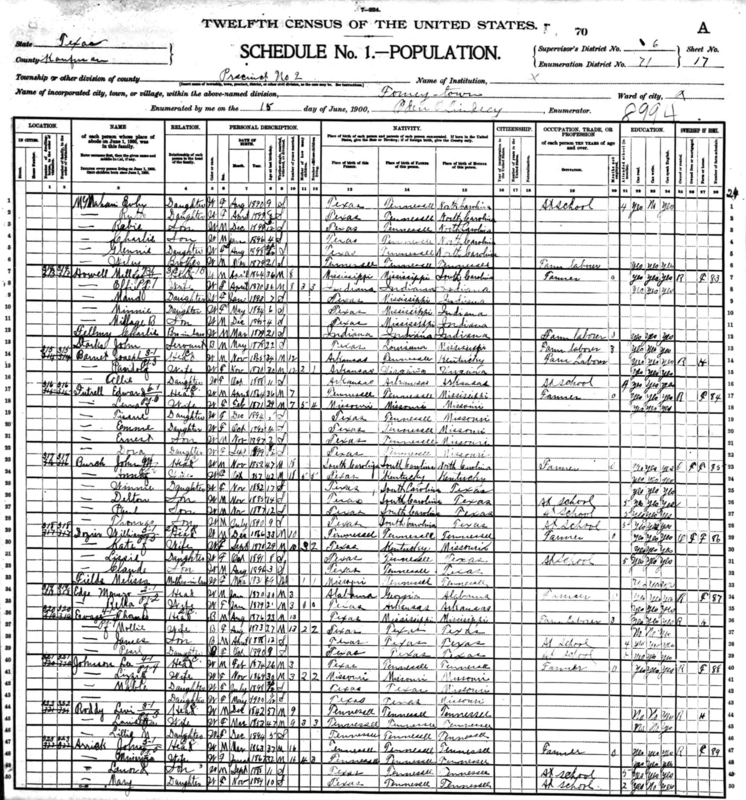 Here is Sallie Breshers, husband John, and 4 kids in the 1910 Census in LeFlore OK.
Can't find them in the 1900, 1910 or 1930 census. Dawes is a list of those members of the Five Civilized Tribes who removed to Indian Territory (Oklahoma) during the 1800's and were living there during the above dates. Only those Indians who RECEIVED LAND under the provisions of the Dawes Act are listed. It also lists those Freedmen who received land allotments as provided for in the Dawes Act. John Riley Arrick's wife Manerva Viola Harrison is thought to be part Choctaw, but she was born in TN. Their daughter, Mary Lee Arrick has Sallie Breshers listed as Aunt. Jane Prater is Sallie's Sister. Lillie Jane Bleer (1876-1976) married John Prater (1874-1941). They lived in Atoka, OK. Here are pictures of their tombstones in Bentley Cemetery, Atoka, OK. In Oct 06 we went to the Hamlin TX cemetery North of Abilene to find graves for Mary Lee Arrick's kids and grandkids. Mary Lee married a Nall, and later a Bamburg, is buried in Lubbock. Her daughter married a Scott. Is there any connection between Sallie's sister Jane Prater and Arrick/Nall/Scott familes? Or is this just a fluke? I found a grandson of Fannie, Cliff, but see no real connection between the Alewine family and the Arrick family. Urbon, her son, said that Fannie's maiden name was "Grant", and that she is buried in Slaton, TX. Tillman Freeman Prater, 69, died unexpectedly on Friday at Warren Regional Hospital. He was a U.S. Army veteran of WWII, resident of Rout 7 and a member of Bethel Hill Baptist Church where he served as a deacon. Services will be at 12:30 today at Bethel Hill Baptist Church with James Hutson officiating. Internment will follow at Centertown Cemetery. Survivors include his wife Christine Prater of Centertown; son Larry Prater of Centertown; four grandchildren; brother Hoyt Prater of Centertown and foster sister Mae Orrick also of Centertown. High Funeral home is in charge of arrangements. Southern Standard, McMinnville, TN. November 1988.